Allegro MicroSystems (Allegro), a leading supplier of high-performance power and sensor semiconductor ICs, established a new research and development centre in the Czech Republic. This new centre is currently staffed with two dozen engineers located in Prague. These talented engineers will accelerate Allegro's development of market leading, innovative ICs for both the automotive and industrial markets. The team will initially focus on developing sensor ICs for electrified vehicles, green energy, and high-efficiency industrial motor applications. "We are very excited to formally open our new R&D centre in Prague. We were fortunate to hire an excellent team of engineers. This high performing team is already accelerating Allegro's leadership position in both the automotive and industrial markets", said Michael Doogue, Vice President of Business Development and Advanced Sensor Technologies at Allegro MicroSystems. "We plan to hire an additional 20 to 30 engineers at the centre over the next few years. The Prague team is an important addition to Allegro's global product development team, and I am certain that they will have a positive impact on Allegro™s product development velocity and our customer support levels for many years to come". 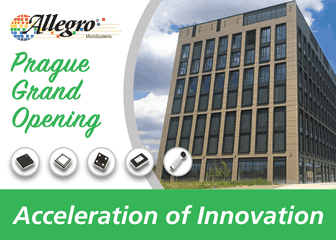 The availability of highly skilled IC design, systems, and software engineers was a major contributor to Allegro's decision to open this new R&D centre in Prague. The area provides an optimum combination of experienced engineers and recent graduates from local universities. Allegro MicroSystems Europe, headquartered in Chertsey, United Kingdom, is the European sales and marketing operation, and operates a network of representatives and distributors throughout Europe. Allegro has a technical and marketing centre in Heidelberg in Germany. Allegro also has an engineering design centre in Edinburgh in Scotland and a technical and marketing centre in Annecy in France.